The manuscript of Alice’s Adventures in Wonderland by Lewis Carroll has gone online. It is now the part of Turning the Pages project by the British Library and thus has joined the following masterpieces: Leonardo’s Notebooks, The Lindisfarne Gospels, The Curious Herbal, and many more. To check the contents of this digital library, go to its Menu. Henry Wadsworth Longfellow (1802-1882), a great American poet and the author of The Song of Hiawatha, had also been an object of parodies. Admittedly, it would be improper for anyone interested in poetry not to imitate Hiawatha‘s verse and rhythm; but parodies are a different kind of exercise. One of the most famous was composed by Rev. George Alfred Strong. He rewrote all of The Song‘s 94 stanzas. The passage below is sometimes attributed to him, sometimes to an anonymous author, but gives a good feel of the main traits of Longfellow’s poem that made it a target for parodists (John Wesley Morris, an American geographer and writer, explained it well in his own parody (below)). And of words most unpoetic? But no honour to the muse. However, The Song‘s fame spread far beyond the United States, and in England Lewis Carroll was inspired to compose his own homage to the opportunities for parodies Longfellow’s poem presented. What is important to remember is that Carroll himself was an avid photographer, which is noted throughout the poem. He was well familiar not only with the technique of taking a photo, but was very observant of the sitters’ reactions: how they wanted to look more beautiful and noble, and how these efforts usually fell through. Amazingly, it seems his observations stand true to this day. – I can’t bear looking at myself, I’m ugly as a cow! 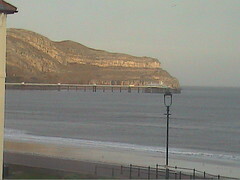 I arrived to Llandudno at about 5pm on Friday, 28th of December 2007. The wind and rain met me at the station, as well as two lines of taxis, with no drivers inside. Turned out, my train arrived earlier, and the drivers were all away to shops. I joined an elderly gentleman and a family couple at the taxi office. By the time I was on my own, we started talking with the lady in the reception. Turned out, she was quite familiar with Manchester: she was a part of the Jewish community who regularly travel from Llandudno to Salford. Then my taxi arrived, and a few minutes later I was in Craig-y-Don where I were to stay until January 6th 2008. Craig-y-Don means “rock by the water”, and Dave Thompson tells us in his illustrated book about Llandudno that this area became popular with residents after the First World War. On the first walk “into town” when I don’t actually know yet where to go, the place seems to be quite far away from the town centre. But as you get to discover all the different ways to get from Craig-y-Don Parade to Trinity Church in Mostyn St, you’ll soon realise that it doesn’t actually take that long. Llandudno itself boasts a remarkable history. The origins of the place date back as early as the Bronze Age, and the remains of the Bronze Age Copper Mines located on the Great Orme is a great tourist attraction, allowing you to explore 250ft below the surface. There, on the Great Orme, is also the church of St Tudno. The church takes its name from the site of a small monastic community founded by the Welsh Christian missionary in the 6th c. AD. I haven’t visited it, but Thompson notes that the church “still has some ancient features within it including a splendid twelfth-century font”. The fate of Llandudno was apparently determined by the Liverpool Architect Owen Williams in 1840s. The image on the left is that of The King’s Head where Williams reportedly remarked that this bay area would make an ideal watering place. His words were related to The Hon. Edward Mostyn MP who had already had plans to exploit the area of Llandudno as a potential summer resort. Some time before Williams’s prophetic remark Lord Mostyn, with the support of the Bishop of Bangor, was able to obtain through the Parliament “the sole rights to develop the low isthmus between the north and west shores”. Williams was commissioned with the survey which, when completed, presented Llandudno as a lovely seaside town, “shaped with a grid of spacious thoroughfares and a sweeping promenade”. 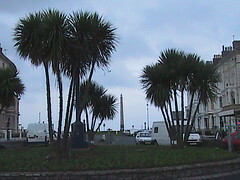 Although it wasn’t Williams who undertook the final planning and building, the progress of Llandudno was compelling, given its unrivalled popularity with the masses, the royalty, and the men-of-arts. 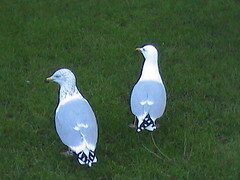 It is still disputed whether or not Lewis Carroll visited Llandudno, but even without him there are enough names among Llandudno’s patrons to make any other town of its caliber blush with envy: Napoleon III, Disraeli, Gladstone, Bismarck, to name but a few. The Queen Elizabeth of Roumania, who wrote under the pen name of Carmen Sylva (commemorated in the name of one of the streets in Craig-y-Don), stayed here for five weeks in 1890. Buffalo Bill came here with his Wild West Show in 1904. The Beatles performed at The Odeon in Llandudno in 1963, and the last person to ever appear on the Odeon’s stage was Billy Connolly in 1986. For references, I am indebted to Dave Thompson’s Llandudno (Images of Wales series, Tempus, 2005). This stay in Llandudno was a good break from the city’s hustle and bustle, and some of you may already have checked my Flickr albums. Richard over at the BBC Manchester Blog was wondering what I would be doing in Llandudno for quite a long period of time. Indeed, I arrived on December 28th and was planning to leave on January 6th, which I did, only instead of taking a train to Manchester I went to Deganwy and stayed for another two nights at Deganwy Castle Hotel. I did a plenty of sightseeing in Llandudno but, being a peregrinating type, I did day trips to Conwy, Caernarfon, and Beaumaris. In case if Richard and all of you are wondering further, I don’t have a car, so my pilgrimages were assisted to a degree by buses, which means, I suppose, that on occasion my eye has caught something I would’ve overlooked, if sitting in the car. On the other hand, not having a car restricts your freedom, so hopefully next time I go to Wales either I’ll be driving myself or I’ll have a car and a driver. I finally made it to Manchester on January 8th, but if I am totally honest with myself and with you, I didn’t want to leave. I had to return to Manchester, not least because I accepted the invitation to a friend’s housewarming party. Richard is absolutely right that there isn’t much to do in Llandudno, but it’s what outside Llandudno that makes the whole journey purposeful. And I don’t even have to mention castles – I can only mention Llandudno Bay and the Great Orme, which look different every time you see them. The houses on the slopes of the Great Orme, when lit up in the evening, reminded me of one image Henry Miller evoked in The Colossus of Maroussi: a Greek valley where stood houses in which windows the lights were coming up was like a bowl with cherries. And it was this bowl that I was thinking of every evening when I looked at the Great Orme from my hotel lounge where I sat uploading photographs to Flickr. 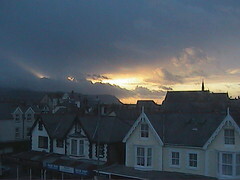 I still haven’t explained why I chose Llandudno. Back in October, I visualised some of the scenes and was convinced that the story would take place somewhere at the seaside. The choice had more to do with how much I actually knew the British seaside towns and cities. The fact is that I know them very poorly. If I am to be very honest, I think my knowledge is currently divided between two “pools”: Blackpool and Liverpool. From either “pool” I couldn’t think of a spot to pull out where I’d want my characters to find themselves. Suddenly I remembered about my short walk along Llandudno Promenade, and then I vividly imagined the wintery bay and the winds. I looked up some photos on Flickr and was convinced that this was the place to set up the story. But then I began to research further, and I realised that there may have been another reason for why I chose Llandudno for my story, although it only came up during research. It’s been years since I watched a Russian cartoon after Lewis Carroll’s Alice in Wonderland and Through the Looking-Glass and read both books. 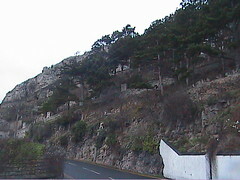 It was in Llandudno that the Liddell family used to stay, and there are still speculations about whether or not Carroll himself visited the Liddells in Llandudno. There are also speculations on the nature of his relationship with Alice Liddell who was the inspiration for both stories. My view on this occasion is that it probably doesn’t matter much whether or not Carroll went to Llandudno. If he did, his imagination would be assisted by personal experience. If he didn’t, his genius, as it dazzles us in two books about Alice, shines even brighter. What cannot be denied is that both books are, as one often calls it, the labour of love. And it is significant for me that both these books are fairy tales. They could be love poems, of course, and then we might have had something of a Victorian equivalent of The Divine Comedy. They could be novellas or a novel. But they are fairy tales. Without going too much in depth about my story, I can say that it explores this connection between love and a fairy tale, childhood and adulthood and the possibility to move between the two. There are other examples, of course, of similar kind of writing for children, and J. M. Barrie’s Peter Pan may be the first to come to mind. Ultimately, one of the questions the story is asking is why fairy tales may be so important even when one seems old enough to get by without them; and what it takes to be able to tell a fairy tale.